I had a chance to experience American Airlines’ new A321T transcontinental plane in January when I flew first class from LAX-JFK, but TPG Managing Editor Eric Rosen put expiring AA Executive Platinum EVIP Systemwide Upgrades to use on a recent roundtrip from Los Angeles to New York and got to fly business class on the new plane in both directions. Here’s his review. 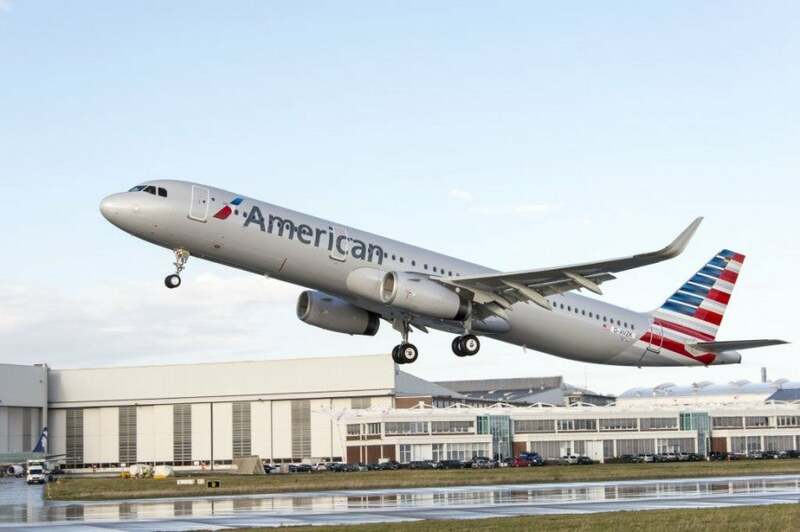 After covering American Airlines’ new A321T’s for a while now, including the launch of transcontinental service between Los Angeles (where I’m based) and New York back in January (and the SFO-JFK route launched last week), I was excited to experience the new plane for myself. I bought a last-minute coach ticket and was able to apply two expiring EVIP’s to it even though my outbound flight was on February 28 (the last day I could use an expiring EVIP) and my return was on March 3. The fact that the return EVIP cleared immediately meant that it could be applied after the EVIP certificate expired. Had I been waitlisted, I would have lost the upgrade when it cleared and would have needed to apply a still-valid one to the itinerary. I actually was waitlisted for an upgrade the February 28 flight I originally booked, the 7am flight. But I checked ExpertFlyer for upgrade space the day before I was due to fly within 24 hours of my departure time, and saw that the 8am flight had a lot of upgrade space available in business class – and it was all the same to me since the plane has WiFi on it and I could work through the flight no matter which one I took – so I called American and same-day confirmed to the later flight and saw my EVIP upgrade clear instantly. I did have to pay the $75 same-day confirm fee, but it was worth it. 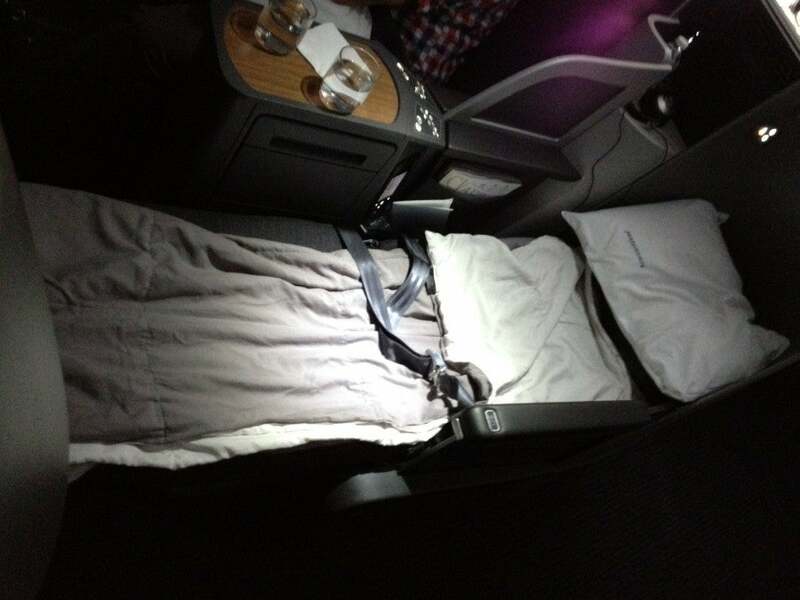 The business class cabin in-flight. The day of my flight, everything was on time, and I breezed through TSA PreCheck at LAX and had time to grab a coffee before boarding my flight. The A321T is a bit of an interesting configuration since it’s one of the only three-cabin transcons left these days. 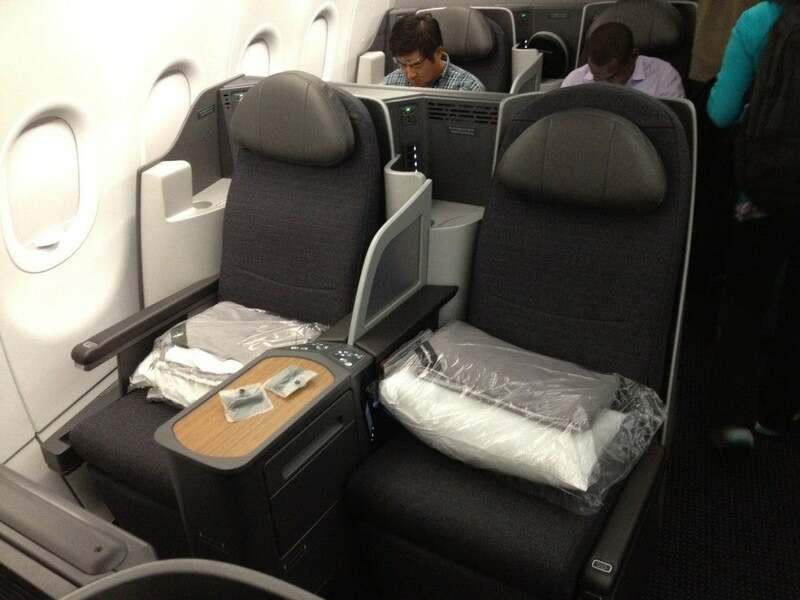 There are 5 rows of first class seats that resemble American’s reverse herringbone 777-300ER business class in a 1 x 1 configuration for 10 seats total. After that is the business class cabin with 5 rows of a 2 x 2 configuration (20 seats total), and then behind that is the 60-seat economy cabin with 10 rows in a 3 x 3 configuration (there are 3 rows of Main Cabin Extra at the front of it). 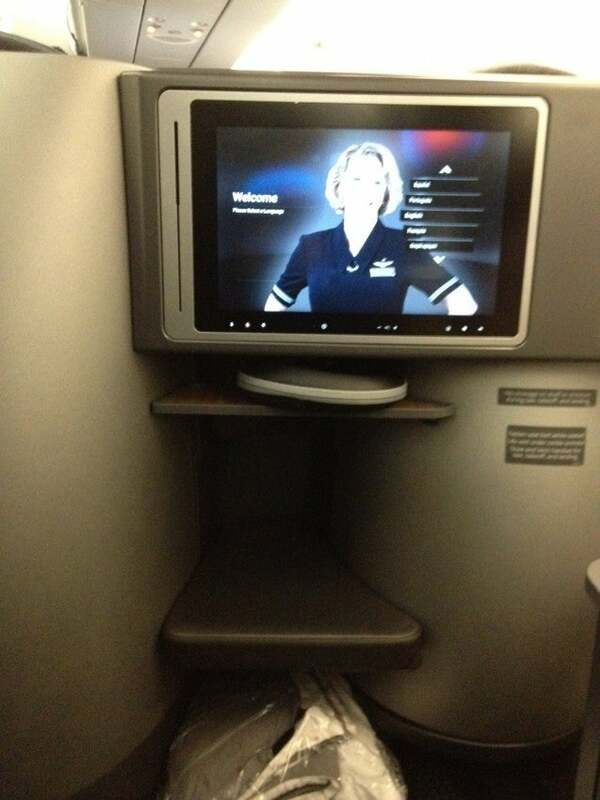 My seat in the business class cabin. 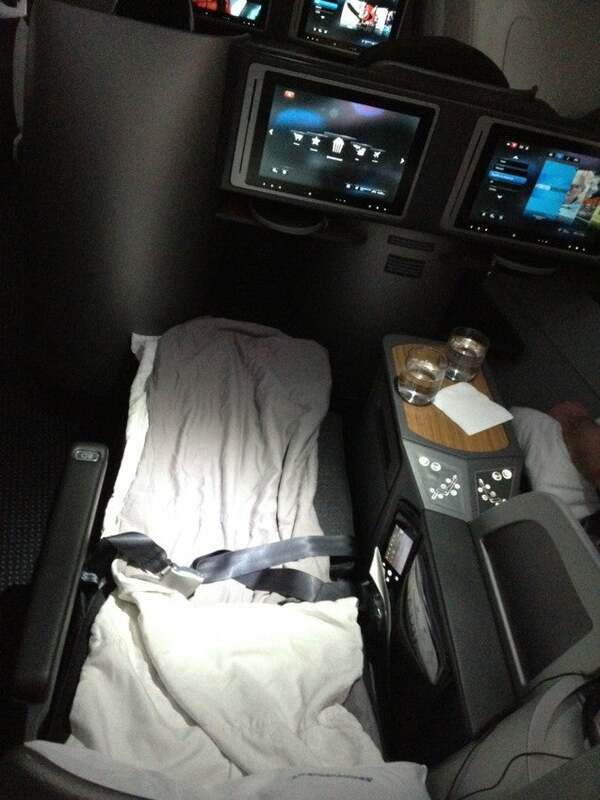 I thought the business class cabin was pretty nice. There was tons of overhead space – there should be since you can’t put anything under your seat, not even in the foot cubby – and the seats are pretty spacious at 58 inches of pitch (they recline to about 75 inches – so TPG might be a little cramped, but I was okay) and are about 19.5 inches wide. Even though you’re seated right next to someone, it feels like a decent amount of privacy because you have two thick armrests between you and a sort of frosted plastic screen between the seats, so even if you’re a little reclined, you don’t really feel your neighbor. The one time it does feel like an issue is if the person at the window wants to get out while you’re reclined or in lie-flat mode because there’s no space to go around you and they have to step all the way over you, so get ready to get personal. The day I flew was pretty bumpy thanks to huge storms hitting the west coast, so the flight attendants were required to stay seated for about 45 minutes. I played around with the entertainment system, which included a seatback 15.4-inch HD screen and was stocked with movies, TV shows and music. The system was controlled both by a touchscreen and a handheld touchscreen remote with a keyboard on the back for playing video games. The seat controls and remote control. 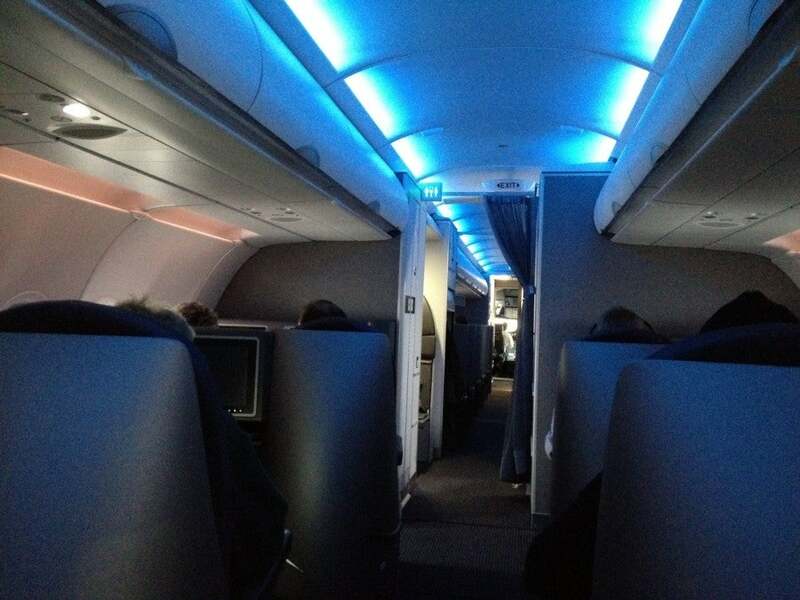 The Gogo came on as usual at 10,000 feet, though, so I got to work pretty quickly and plugged in the Bose noise-canceling headphones that had been left in my seatback cubby to listen to the pop soundtrack in the music selections. 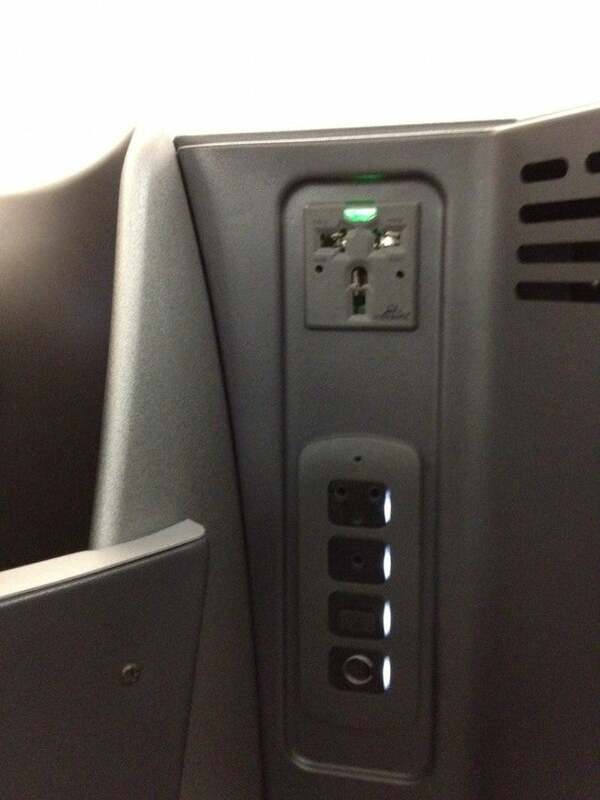 The seat had a universal adapter plug and various other AV plugs, so I could charge all my electronics and could have watched something on my computer on the IFE, but I was working. 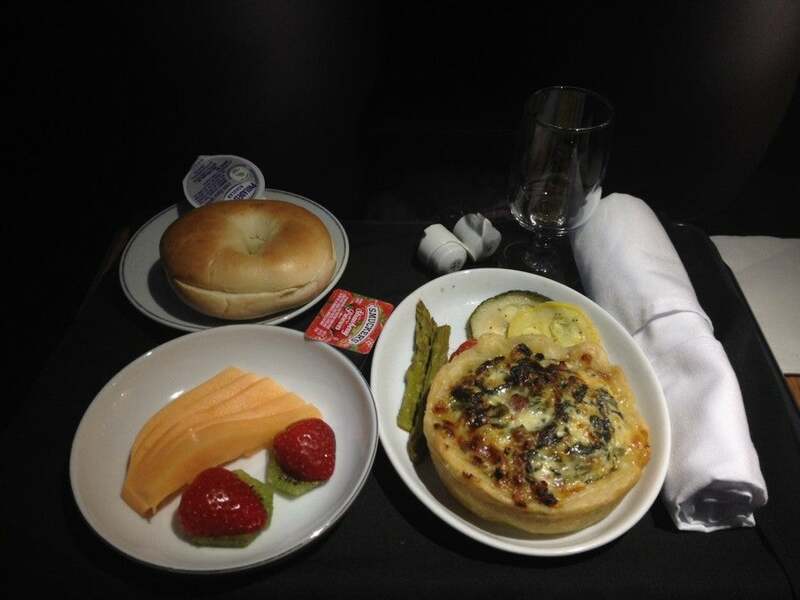 As soon as the captain turned off the fasten seatbelt sign, the flight attendants came through with warmed nuts and a beverage service where they offered water, soda, cocktails and wine as well as morning mimosas. Then breakfast service started soon after. Choices included steel cut oatmeal with fresh berries and brown sugar; smoked lox and a bagel with cream cheese, tomatoes, cucumber and capers; and a turkey bacon quiche with grilled vegetables (that were mostly asparagus), which is what I chose. The turkey bacon quiche with grilled veggies and fruit. There was also a nice little fruit plate with cantaloupe and strawberries, and a choice of bread – I got a bagel with cream cheese. What was funny was that the bagel I got was full-size, but the one that came with the smoked salmon was actually tiny, so a lot of people who had ordered that option ended up asking for another bagel! The beverage list included AA’s current wine list of Valdo Prosecco Brut, Cecchetti Line 39 Sauvignon Blanc and Rued Chardonnay from California, Ottimino Zinfinity Zinfandel and Echelon Cabernet also from California, and a choice of spirits. On my outbound flight, I abstained since it was still pretty early in the morning, but on the return flight, I tried tastes of both the whites and while the Rued Chardonnay was a little creamy and woody for my liking, the Sauvignon Blanc was a bit more refreshing with tropical notes and more acidity. I’m not going to do a separate review of my return flight, so I’ll just include the options and photos here. 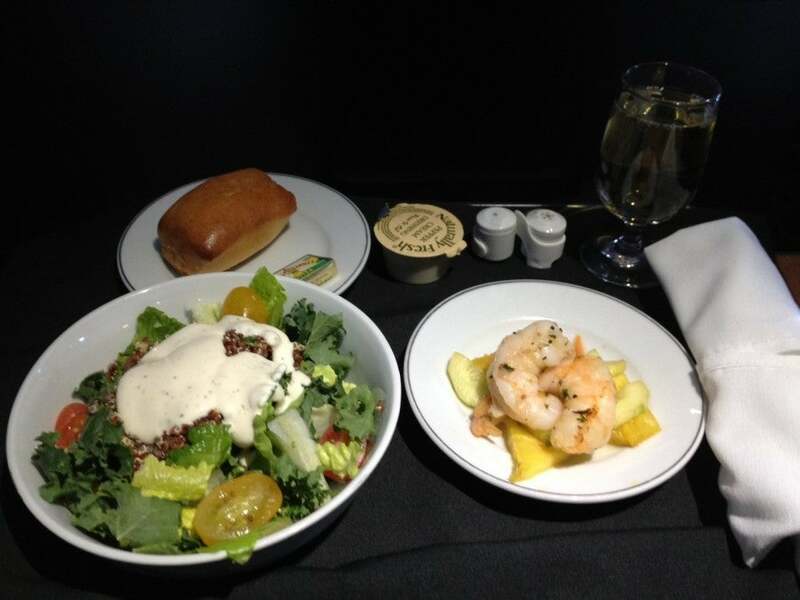 The starter was marinated shrimp served over cucumber relish and grilled pineapple along with a seasonal green salad with red quinoa tabbouleh – the flight attendant took my order and was dolloping huge ladles of dressing on it before I could ask her to stop, so it got a bit drenched. The starters on my return flight. 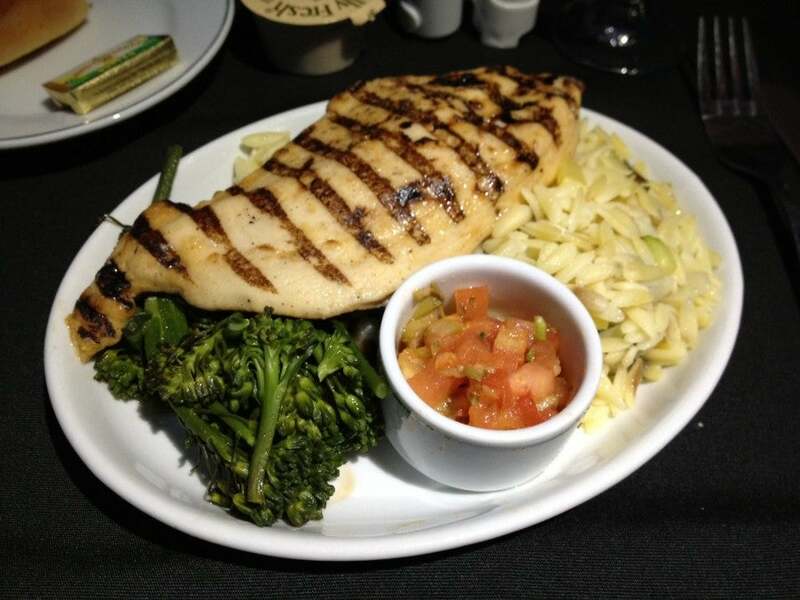 For a main, I chose the grilled chicken with tomato-olive tapenade served with orzo pilaf and broccolini. I was actually nervous about this since the other two options sounded kind of gross and I was afraid they might run out, but I got mine in. The other two mains were a salad with red-skin potato wedges and bleu cheese served with Black Angusbeef skewers and a red curry sweet potato soup. It looked okay, but not that appetizing. The vegetarian main was a mushroom stroganoff with traditional spatzle and spinach. The chicken was a generous portion, but not terribly interesting. Just a dry, semi-salty grilled piece of meat with some sauce on the side and orzo and greens. I liked it because it was simple and the healthiest option, but I wasn’t that impressed overall. Dessert on the flight was the standard DIY ice cream sundae service and they baked cookies onboard as well. After the breakfast service and getting a little more work done, it was time for nap. My bed in the fully reclined position. The bed went all the way down in about 20 second and I opened the package containing a light duvet and medium-size pillow and made up my own bed. I’m only 5’8″, so I was able to stretch out fully and sleep on either side or on my stomach, though the foot cubby did require some moving around to get comfortable. An overhead shot of the bed. As I was getting ready to lie down, the flight attendants brought by bottles of water for everyone and wished me a pleasant nap. Now, partly because I was still jet-lagged from Australia (I’d gotten back about 48 hours earlier) and partly because it was still a pretty early morning flight, I was out cold almost as soon as I lay down and I slept for about 90 minutes. I’m not normally a great plane sleeper, but the bed was pretty comfortable and I was really tired, so I actually got a great rest in, and only woke up because the cabin was unusually hot. I downed the bottle of water, got another from the flight attendants and still had about 90 minutes to work before landing, so I perked up with a coffee and got to it. On my way back, I remembered that the first class cabin actually has a cappuccino machine, so I asked the flight attendant if I could have a cappuccino. She said it’s normally just for first class passengers, but she’d sneak one back to me. 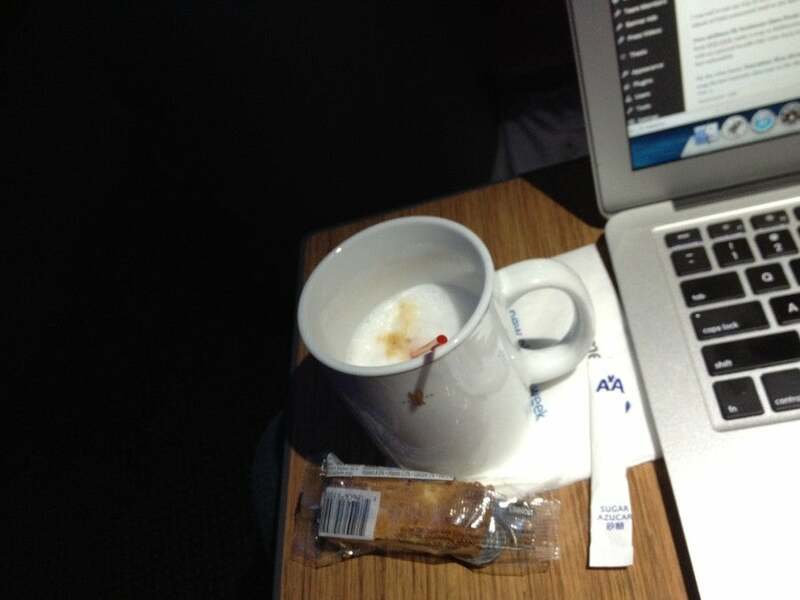 She brought it in a regular mug so the other business class passengers wouldn’t ask questions! It still tasted good though, and she brought a biscotti to have as a snack along with it. The flight attendants also brought through basket of chips, nuts and cookies. About 30 minutes before landing the flight attendants came through and collected the Bose headphones though you could still use your own if you had them. I continued working and listening to music until the Gogo went out at 10,000 feet and then just relaxed for the 15 minutes or so before landing. Deplaning was great and only took me a few minutes since there were only 7 rows of people ahead of me, and I was out and into the taxi line in no time. 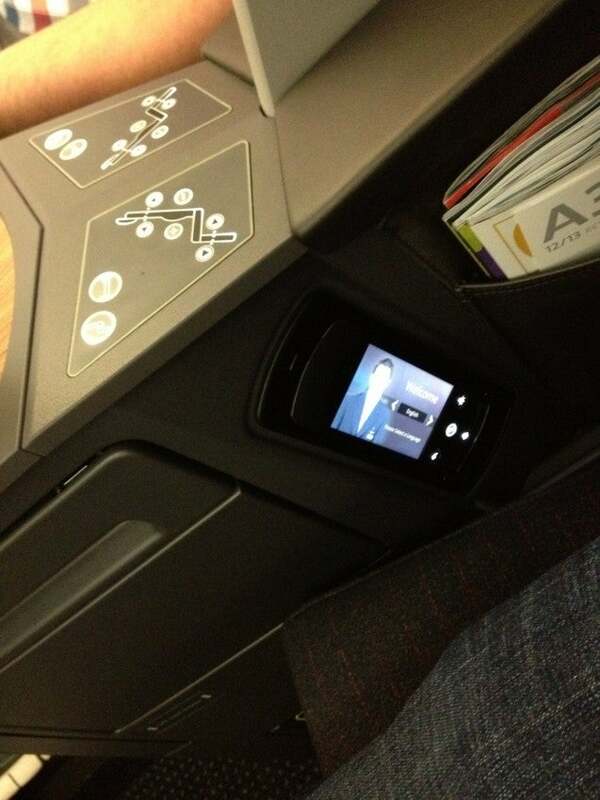 All in all, it was a pleasant, smooth experience and I really enjoyed the new seats. While this isn’t a game-changing transcontinental business class product, it’s about time American caught up with the competition with a lie-flat seat, and these are nice ones I would be happy to fly again.